Warmzone radiant heat snow melting systems provide effective snow melting for virtually any size, shape and type of driveway. The ClearZone radiant heat cable is one of the most durable and versatile snow melting cables on the market, making it the ideal snow melting solution, and a favorite among professional builders and homeowners alike. There are many snow melting system options, and the heat cable can be installed in a variety of applications, including concrete pours, hot asphalt, and under pavers. Concrete is the most common application for the ClearZone snow melting system. Prior to the concrete pour, the heating cable is secured to the remesh with wire ties and spaced at 3 to 6-inch intervals. (Watch the "securing the heat cable" videos.) The ClearZone cable can be customized to heat any size or shape of driveway, ranging from large commercial projects to residential driveways, sidewalks, patios, etc. Once installed, the ClearZone radiant snowmelt system is virtually maintenance free and will help to preserve the quality of your concrete driveway and sidewalks. Because of the ClearZone cable's high quality and durable makeup, it can withstand the heat and compression of newly poured asphalt. ClearZone heat cable for asphalt snow melting systems has an external jacket rated for asphalt temperature of 220°F (105°C) [460°F (240°C) for up to 10 minutes]. The radiant heating cable is laid out on the base surface (usually sand), and the asphalt is hand shoveled onto the cable and base surface. Insulation is recommended, but not required. One inch rigid insulation can be installed underneath the base surface, or the insulation can be laid on the base surface and the snow melting cable can then be secured on top of the insulation. 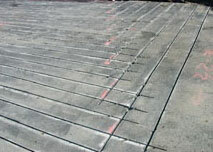 The ClearZone radiant heating system is unique because it isn't limited to being installed in new driveways or sidewalks. If you have an existing asphalt driveway and intend to re-pave it, you can retrofit your driveway with a ClearZone radiant heat system. Ideally, ClearZone cable should be embedded under 2-inches of asphalt and is secured to the existing asphalt with clips and nails (for mats). The new asphalt is then hand shoveled onto the existing driveway and cable. ClearZone cable is simple to install and provides the best performance for heating asphalt driveways. Concrete driveways can also be retrofitted with radiant heat by using saw-cut technology, where grooves are cut into the cement and cable is then placed in the grooves, covered by a special epoxy. ClearZone radiant snow melting systems are the most effective systems for pavers. Installing a snowmelt system under brick pavers is also one of the easiest radiant heat installation methods. The heating cable is simply laid out on the base surface of the area to be heated and the pavers are installed as normal over the cables. Because the ClearZone cable has been tested and approved for wet conditions the cable can come in contact with moisture without its performance being affected. 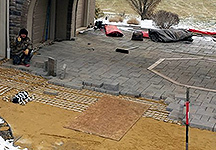 In addition to electric radiant snow melting systems, hydronic heated driveways can also be installed. For additional information and instructional videos on radiant heat and snowmelt systems, visit our radiant heat pressroom. Or contact a radiant heat professional today at 888.488.9276. Advanced thermostats and state-of-the-art snow sensors ensure energy-efficient snowmelt operation for your heated driveway. The radiant heating system utilizes minimal energy, activating only when needed and sutting off automatically after the storm. The snow sensor (typically mounted above the roofline where it is exposed to inclement weather) activates the driveway heating system when precipitation is detected and temperatures are below 39°F. The heated driveway system can also be activated manually in cases when wind has blown snow onto the driveway or runoff from other areas collected on the driveway forming ice in shaded areas. Warmzone is committed to providing the latest, safest, and most reliable technology available. Consequently, installing the snow melting system will not void any existing home fire insurance policies. The ease of installing electric snowmelt systems minimizes labor costs, and the operating cost of the snow melting system is modest. Installing an electric snow melting system provides a number of significant benefits, including extending the life of your driveway. Radiant heated driveways and sidewalks increase property values, eliminate the need for snow shoveling or using salt and harmful snow melting chemicals. The systems operate cleanly and quietly, providing reliable, maintenance-free, automated snow removal. You'll never have to worry about shoveling snow again! For more information, call 888.488.9276.